It is about nine-fifteen at night on a Saturday preceding our month-long trip to Europe and I’m not even packed yet. Instead, I am posting a few new pictures here to let everybody know I’m alive and kicking after a week of a non-stop sweat fest at Da Vinci. Last Friday we served my One Bite at the restaurant, and I was bouncing on the inside with pride for it was very well received by the diners. 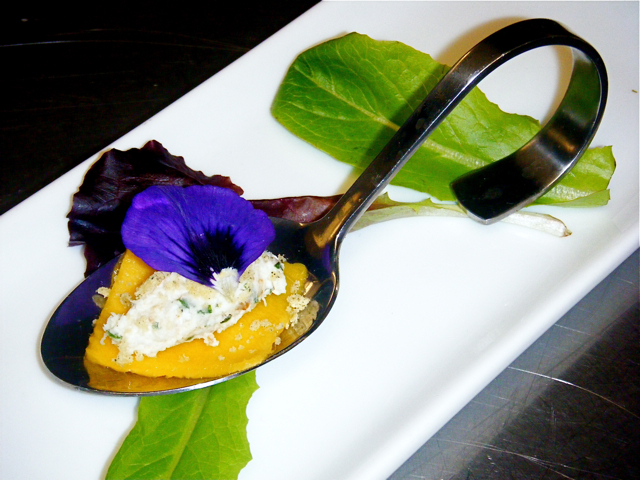 It was a Mascarpone Crab Cream with Smoked Cashews, Chives, and Spiced Rice Powder over Mango. I made another version with a slice of a strawberry on the bottom. Both looked spectacular. We also sold out the soup of my creation. Can you imagine? I’ve just begun my apprenticeship there and the executive chef allowed me to make such a significant contribution to the menu. 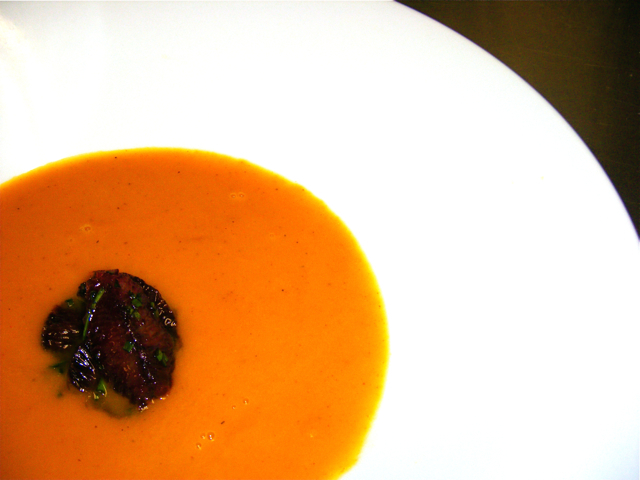 As the orders for the Soup of the Day started coming in, we poured into bowls this gorgeous orange nectar of a soup, my Carrot-Ginger Cream with Marinated Blood Oranges. The menu is full of wonders worth exploring. However, I want to brag only about my three pennies since, how shall I put this, it’s my blog. My next installment should come with photos of some Polish classics, as I know my mom has been cooking for the last four weeks since she had learnt about our arrival in Poland. Yes, Jason and myself will travel to my homeland leaving tomorrow. I shall be in touch and keep ONE MORE BITE updated on a semi-regular basis. Get ready for all those European flavors as I’ll be bringing this and that from the Old Continent to the table.